If you have ever attended a The Flaming Lips concert or talked to a friend about seeing them live, you know exactly what to expect when you go. This show being at Oakland's Fox Theater is possibly one of the most perfect places to see this Oklahoma City psychedelic powerhouse. During the introductions there were fans lined up on each side of the stage split with the ladies on one side and the gentlemen on the other side dressed in their spiffy orange outfits. 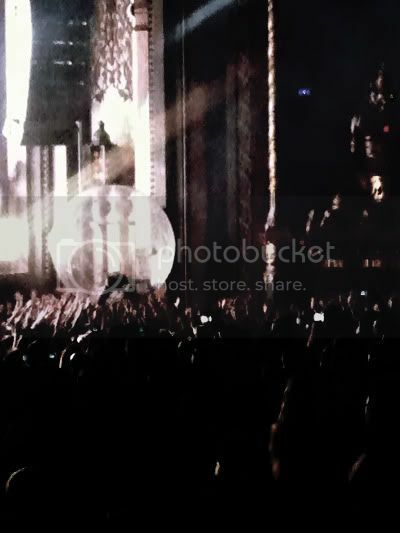 While the rest of the band is emerging behind a lit up screen, popping out of a make shift door came Wayne Coyne, busily becoming the boy in the bubble (literally) rolling out into the crowd walking on his clear plastic shell (a true event/staple of contemporary Flaming Lips shows). While this madness was still going on- lights shot out everywhere, and confetti snowed down from the rafters covering every inch of the venue. During their set it's easy to get lost in the madness going on that would make Rip Taylor quiver with glee. FYM's old favorite "She Don't Use Jelly" had the sold out crowd enthusiastically singing along to every word, it was so loud the band themselves could barely be heard! A clever, obvious use of lasers came during "Laser Hands" of course, as Coyne emerged with two giant green hands that shot lasers all throughout the theatre. The encore just featured a San Francisco stoner version of "Do You Realize??" that easily tripled the length of the original recording. When you have to put lasers, confetti, a microphone camera, and use two massive disco balls during your set everything just seems to go by so quickly. 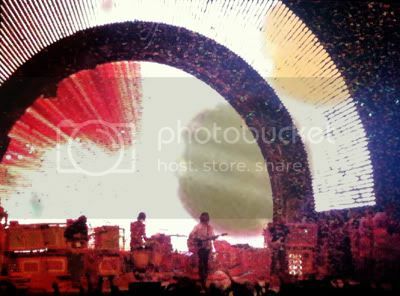 Now known for their truly joyful live celebrations, The Flaming Lips impressed us with their unparalleled craftsmanship in the art of entertainment. 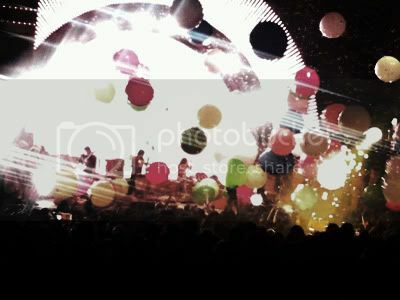 The Flaming Lips have the rest of this week off, and then head to Austin City Limits. In the meantime, we are going to invest in lasers and confetti companies.